I absolutely love that new TV show Hollywood Game Night and thought what a fun idea to entertain the family during holiday break. 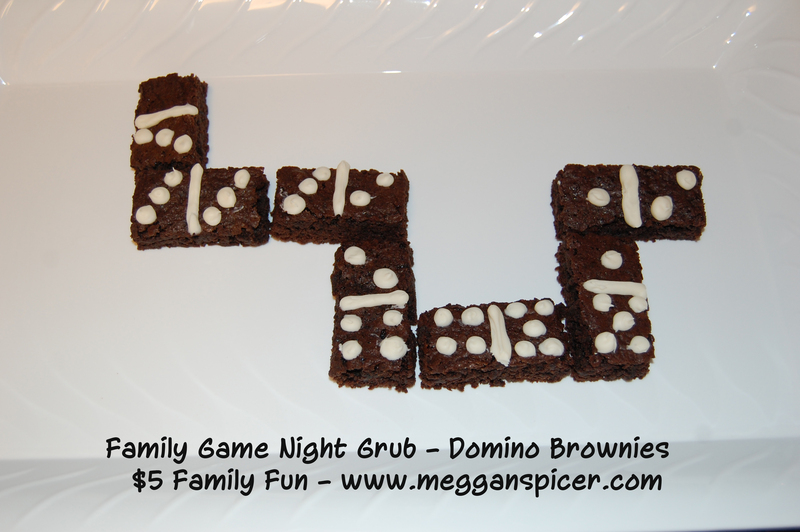 Here are some entertaining and affordable ideas for a Family Game Night…$5 Family Fun-style. If only 3 people, have one charade actor/pictionary artist designated to act out or draw the words or phrases for both of the other players. If at least two separate players of each team, rotate turns acting out or drawing. You must not speak or make sounds when you are acting out your charade or drawing. Agree upon a time limit, usually 5 seconds to study the word or phrase and then about one minute to act or draw. Also agree on a time limit to guess the correct answers. The team with the most correct wins the game. Another game option would be to pick up board game from a yard sale for $1. All that competitive play can make your crew hungry. Serve up some easy to make Domino Brownies. You can also let the family share in on the fun of decorating them. Make the brownies according to package directions. Once cooled, cut into rectangles. Fill a zip top baggie you have in the kitchen with the white icing. Close and them snip bit off of one of the bottom corners of the baggie. Use this as your pastry bag to pipe out lines and dots to turn your brownie rectangles into delicious dominos.